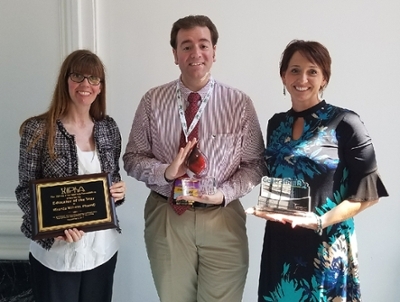 Southern Illinois University Edwardsville School of Pharmacy (SOP) faculty and alumni received multiple accolades during the Illinois Pharmacists Association (IPhA) conference held Sept. 7-10 in St. Louis. Jessica Kerr, PharmD, assistant chair and professor in the Department of Pharmacy Practice, was honored with the Cardinal Health Generation Rx Champions Award and the NCPA Leadership Plaque. She was also sworn in as president of the IPhA. Miranda Wilhelm, PharmD, clinical associate professor, achieved the Educator of the Year award. Alumnus Harry Zollars, PharmD ’13, was named Distinguished Young Pharmacist, and preceptor Starlin Haydon-Greatting, MS, BSPharm, was honored for Excellence in Innovation. Kerr credits the efforts of the American Pharmacists Association – Academy of Student Pharmacists Organization (APhA-ASP) student chapter for supporting her receipt of the Cardinal Health Illinois Generation Rx Pharmacist Award. The award includes $500 to be donated to a nonprofit organization. Wilhelm, who specializes in self-care and immunizations, expressed her appreciation for the opportunity to teach at SIUE and her passion for using real-world examples in her teaching. The Illinois Pharmacists Association (IPhA) is dedicated to enhancing the professional competency of pharmacists, advancing the standards of pharmacy practice, improving pharmacists’ effectiveness in assuring rational drug use in society, and leading in the resolution of public policy issues affecting pharmacists. Photos: (L-R) Dr. Miranda Wilhelm, Dr. Harry Zollars and Dr. Jessica Kerr. 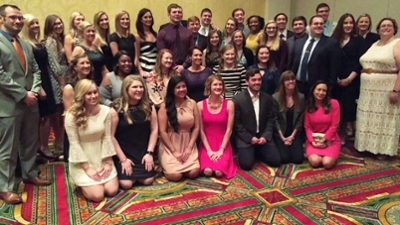 A group comprising SIUE School of Pharmacy faculty, alumni and current students attended the 2017 IPhA conference in St. Louis.